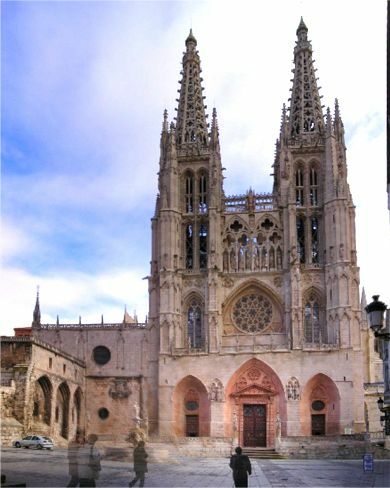 The Gothic Cathedral Our Lady of Burgos, begun in 1221, and completed in the 15th and 16th centuries. The façade, in three stories, has triple entrances in ogival arched framing, with a gallery enclosed by a pinnacled balustrade and a delicately-pierced rose window. There are more balustrades and balconies in the towers, with further open-carved inscriptions: needle-pointed octagonal pinnacles finish the four corners.